Another day, another pod. Once again, this pod had no deck escape without a loss, and there were some really close games. There were quite a few Dragon sightings tonight, and these decks were around the same power level. None of these decks are favorites to make a deep run into the rest of the tournament, but the games had some solid Keyforge action. One Sentence Summary: Each deck tried to forge the final key for about 3 turns in a row before someone finally blinked. This is a Logos version of Bait and Switch in the best case scenario, but it usually doesn’t happen that way. This game, the Dimension Door played a huge role. Notable Event: Boomdalf jumped ahead to an early lead and forged two keys before Morphopodes could react. OSS: Yoren lost this game despite having Kelifi Dragon on the table for multiple turns. I’m highlighting this card since it is a fun card, despite not winning this game. 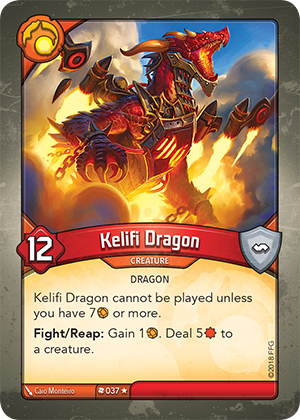 Kelifi Dragon is hard to get onto the field, but if it survives for any length of time will just take over the game. Just look at how sweet this dragon is. Reaping with the dragon is enough to kill most creatures while generating 2 aember. NE: Bronze won this game despite being terribly far behind on board. The Shadows cards generated a lot of aember, and Miasma was played at a pivotal moment later in the game. OSS: Bronze completely shut out Morphopodes and didn’t care that Morpho had captured any aember during the game. 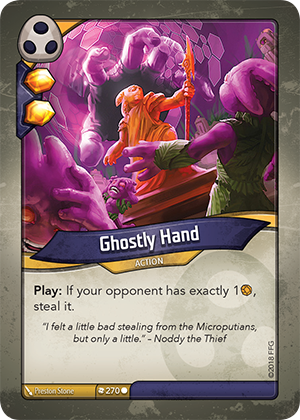 Ghostly Hand did not even use its text box in this game, but playing three copies of it will generate a key for you. This card is analogous to Dust Pixie: there is some upside to generate more , but most of the time 2 aember is all you want from the card. NE: Noddy the Thief picked up a Mantle of the Zealot and got busy before a Niffle Ape had words with him. OSS: Yoren used a disgusting Library Access turn to kill a board full of creatures, stop a key from being forged and then set up the win. This was Phase Shifted during the Library Access turn to kill two Trolls and a Yxilx Dominator, 25 points worth of power. This card is an incredible catch-up card. NE: Yoren played Kelifi Dragon and Boomdalf immediately responded by using Orbital Bombardment and Mass Abduction to deal with the Dragon, a Troll and Valdr. OSS: Yoren took over the board, and kept murdering creatures for fun and profit. 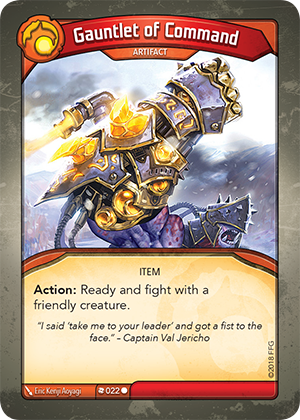 Yoren was in a dominating board position, and Tolas let the fight for board control turn into an aember generation. 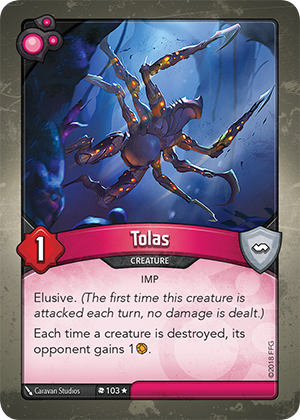 Tolas combos well with Three Fates. NE: A Bouncing Deathquark combined with Tolas to put the game out of reach at the end. 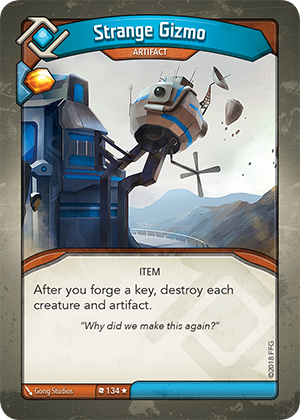 The only key that Morphopodes was able to forge was the one that was gifted on the last turn. OSS: A contingent of Brobnarians took up residence on the board and made themselves at home. 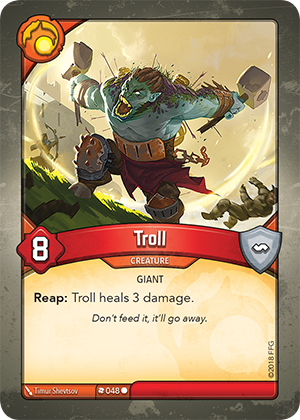 Trolls didn’t win the match by themselves, but Trolls killed Krumps, who could have made the fight for board control difficult. The Trolls just hung around afterwards to help with aember generation. NE: Boomdalf activated Brobnar creatures about 3 turns in a row. Bronze is home to a gross Shadows portion. The creatures are serviceable, but the actions here are just plain rude. This deck needed the Coward’s End to fight out of the hole it found itself in the last game of the night, so board control is never certain with this deck. Fortunately, it almost doesn’t need a board presence due to the amount of aember generation at its disposal. There is the potential for a huge spike in aember with two Loot the Bodies and Coward’s End. 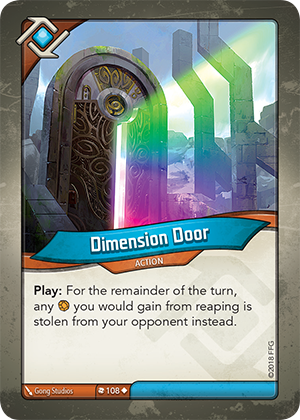 There are some cards here that the opponent has to play around to avoid getting blown out: Doorstep to Heaven, Too Much to Protect and Bait and Switch. 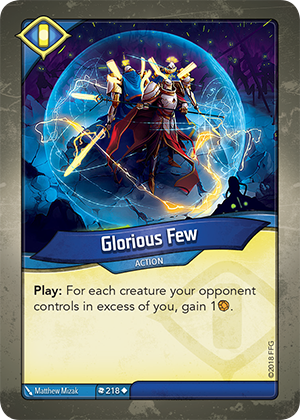 Mack the Knife and Mantle of the Zealot give some cross-house capabilities to the deck, and Commander Remiel, Sergeant Zakiel and Relentless Assault also help with this. This deck isn’t unfair, but it certainly can do unfair things from time to time. This is a solid deck that might be able to advance through Round 2. This deck has a lot of powerful cards that can generate a lot of chains. There were not many games where this deck didn’t have chains for several turns. 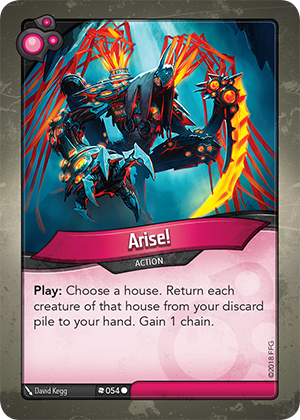 Yoren is a little light on creatures, but the two copies of Arise! can allow this deck to get the most use out of them. This deck really wishes it had a Mother or two to help offset the chains, but Library Access can do absurd things in this deck. The Brobnar is solid and this deck played the Kelifi Dragon fairly consistently. The Dis here can punish the opponent’s hand, and a spot of artifact disruption is always welcome. Tolas won one game for this deck, since it is pretty efficient at killing creatures in a variety of creative ways. Skippy Timehog is a card that can ruin plans, and this deck can pull it back several times in a game. Boomdalf has an intangible quality to it that makes it difficult for it to win games. The aember generation in this deck is very poor, as there are only five cards that have an aember bonus for playing them. This deck has TWENTY-FOUR creatures, meaning that it can endlessly march soldiers to their death. Neither Key Charge or Key Abduction actually forged a key for this deck, and that is probably due to the low aember bonus counts. 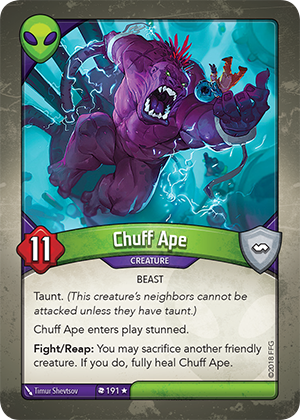 The creature quality in this deck is a little bizarre, since there are several creatures that I would consider very good. Dominators can protect the Witch of the Eyes, and Trolls kill 95% of creatures in the game. The biggest detraction for this deck is the dearth of cross-house synergies. This deck lacks ways to utilize resources on the board when activating other houses. This deck plays a very fair game in that regard, and it suffers for that. I’m sure this deck has good match-ups, but I’m not positive what they look like. There are a lot of disappointing cards and half-formed combos in this deck. Hayyel the Merchant and Veylan Analyst only have three artifacts to work with. The two Troop Calls have two Niffle Apes to work with and no Full Moon or Hunting Witch. The game this deck won could have been considered a fluke since it managed to draw Dimension Door after reshuffling the deck. 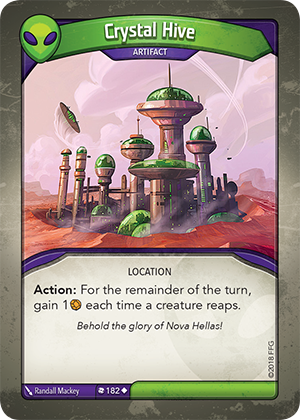 There is not a lot of aember control, and Nepenthe Seed would have to be heavily relied on to grab the Dimension Door to keep this deck from losing. 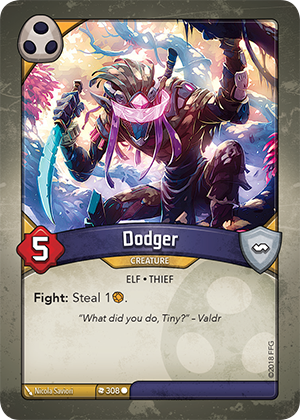 Foggify is an important card, since this is one of the most populated Logos decks that we’ve seen on stream. This deck doesn’t fight for the board very well, and really needs Halacor or some of the larger Sanctum creatures to have an advantage. Cleansing wave isn’t at its strongest in this deck, but it can always be good for some aember generation. Definitely a weak deck, but one that can steal a game here or there. Known Errors: Chains, as always, were forgotten and then corrected. 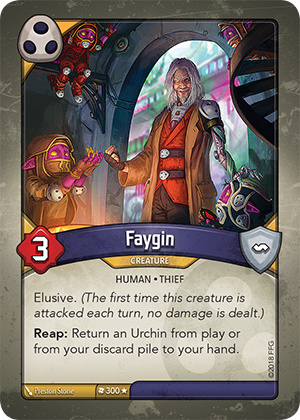 This pod was played on New Year’s day, and there is no better way to start off the year than playing some Keyforge! The night’s games ended up in a paper-rock-scissors match-up, and no deck escaped this pod undefeated. I’ll be the first to admit that we made a ton of mistakes on this stream, which is something that you would think that we would be better about after 120 games. One Sentence Summary: Underzard’s silly Mars turn put Lucelle behind for the whole game. This was the best use of this card that we have seen on stream. It will be hard for Key Abduction to top its performance in this game. Notable Event: The Key Abduction turn started with three Martians reaping, then Key Abduction being played, and then two Martians coming into play ready, an attack by Mooncurser and aember being stolen. It was sort of like a Martian version of Epic Quest. OSS: A really close game was decided by single card. This card was played multiple times during this game, and ultimately won the game. NE: This was a long game and both decks were very good at controlling the opponent’s aember. There are a number of plays that had long reaching effects, and its tough to say if any one of those swung the game in the long run. OSS: How do you negotiate with a deck that will blow up its own artifacts? He is Champion Tabris lite, but considering how good Tabris is, being slightly worse than her is not the worst thing. Francus fought on this congested board really well, and captured key aember to keep keys from being forged. NE: At the end of the game, Ada played Oath of Poverty which generated 5 aember. OSS: Dahl and Lucelle both stole and captured a ton of aember from each other. This card warped the middle of the game, since Dahl was able to gain a ton of aember from it. NE: Lucelle did stop Dahl from forging the game winning key for around three turns in a row and was just an aember short of stopping the final key again. OSS: He who controls the aember controls the game. If there was a big swing in this game, it was when Booby Trap killed three creatures. 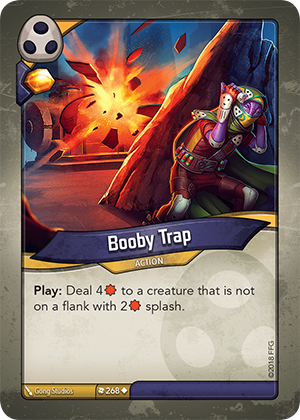 Due to Booby Trap’s restrictions, it can be difficult to use. Here, the card was played for maximum effect. NE: This game had a lot of interactions, and its tough to say which one ultimately won the game. Mother was left alive for too long, and the Dis creatures caused a lot of problems. 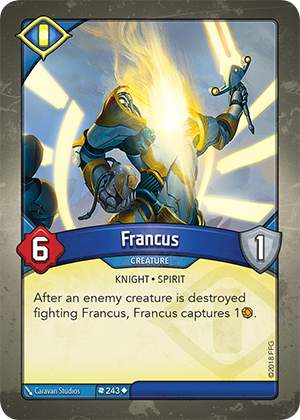 OSS: Lucelle defies the odds and wins versus the undefeated deck in the pod. This card cleaned up a messy board before it could get out of hand. NE: Ada forged an early key off of Oath of Poverty for five. Ada had actually jumped ahead to a two key lead in this game before Lucelle came back and won the game. This deck has a bounty of aember control in it. The Logos in this deck has an uncharacteristically large amount of it at its disposal. The Sting plays an important part, and it combos well with Lash and Too Much to Protect. This deck does struggle to fight for the board, but small creatures are not safe against this deck. There are no board wipes here, but Sneklifter will take problem artifacts. Knowing when to use Lifeward will be difficult, since there is no way to look at the opponent’s hand. I would put this deck in to the upper mid-tier of decks since it plays a solid aember control game. 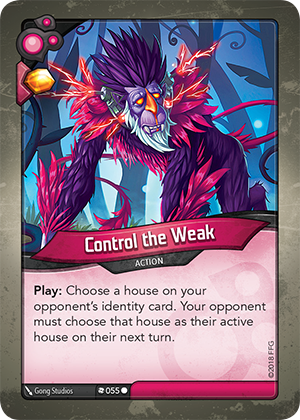 Ada is winning as long as it is playing Control the Weak multiple times in a game. It can control the board in several different ways, and it has the option to wipe it all up if things are coming unglued. Two Witch of the Eyes and Nepenthe Seed give the player several ways to play the best cards over and over. Oath of Poverty gives this deck a way to make big aember gains, but does require a little setup ahead of time. This is a solid deck with some potentially unfair draws. The Mars in this deck is a Battle Fleet away from being degenerate. This deck matches up against other creature decks really well, but tonight we saw it lose to decks with more powerful actions than it. The Shadows in this deck is not cutthroat like other decks, and it is missing some of the cards people fear. Selwyn the Fence is a card that has never found a way to leave a mark on the games we’ve played, and the same is true for Smiling Ruth. There are some cool combos in this deck. Customs Office and Whispering Reliquary will nearly negate your opponent’s ability to play artifacts. 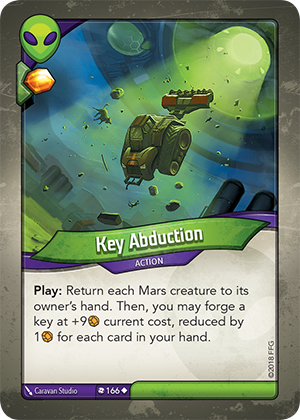 Two Key Abductions means that there is a chance that this deck could win out of turn and your opponent will not be able to stop you. This is a cool deck and would be fun to play in casual settings, even if it didn’t set this pod on fire. Lucelle did not have the powerful answers it needed to advance. This deck does have a solid game plan, and it will just murder creatures that are under a certain size. There was a lot of armor in this pod, so a lot of the damage this deck could do was absorbed. This deck also relied heavily on creatures to produce aember, which is why it always felt as if it was playing from behind. There was never a point in time where this deck had all three Trolls on the table, but I bet this deck would be in better shape if that ever happens. This deck would match up better against non-Sanctum decks, and probably has a really good chance against Shadows-based decks. Known Errors: The usual errors abound: Mother, Staunch Knight, Chains, etc. There were a couple of times that Bulwark’s armor was missed. Deipno Spymaster is a card whose ability is easy to forget about. Nathan used a Whispering Reliquary out of house in game 5. Nathan also played a Take Hostages as if it were Terms of Redress. These mistakes happened in a game that he lost, so these did not impact the tournament at large. This pod is a return to normalcy after the high octane combos of the previous pod. For Pod 20, it has become clear to us that the decks that typically do the best are the decks with the most aember control. We have a direct correlation between quality and quantity of aember control and decks that have advanced to the next round. This explains the dominance of Shadows, and why Mars is usually frowned upon. 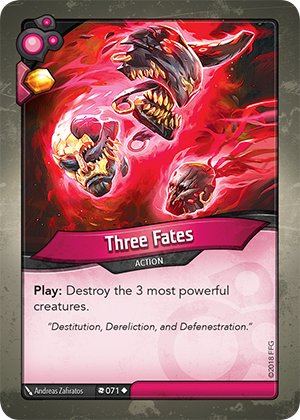 I’ll revisit this theme in the Round 1 recap, but for now, enjoy some more Keyforge carnage! One Sentence Summary: Mr. Goldsee found out how hard it is to win against some of the best cards in the game. Instead of highlighting Bait and Switch for the eighteenth time, I’ll point out this card which made a subtle, but important play. 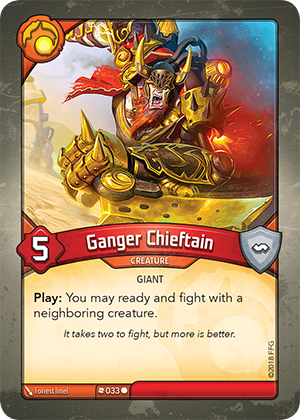 Ganger Chieftain got a Krump directly into combat to keep Mr. Goldsee off a key, and since the end of the game was a sprint for the final key, it probably saved the game. Notable Event: A Bait and Switch swung the match in Temujin’s favor towards the end of the match. 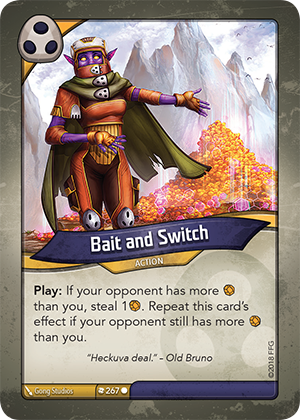 Lash of Broken Dreams and Bait and Switch often put the opponent in really tough situations where it is impossible to play around both cards. Arise! also played a part in this match, as the squad of Brobnar goons it brought back were quite formidable. OSS: Plan A for Webenvy is to keep all of the opponent’s aember on an Ether Spider and pray that the opponent doesn’t realize there is no Plan B. This is the worst board wipe, but this game had the best case scenario for it. NE: After setting up a few turns in advance, Save the Pack wiped out one side of the board, including an Ether Spider with 12 aember. A Strange Gizmo secured the future, by making it so that nothing played by Webenvy could threaten the following turn. OSS: Temujin stayed in control of the game the whole time. Charette put a dagger through Barkus Rex at the end of the game. 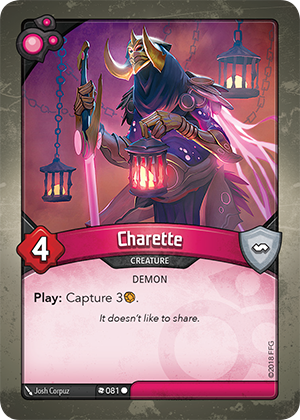 I’ve highlighted this card before, but Charette is particularly good in decks with Arise! NE: Its tough to call out any single moment in this game, since Temujin was just beating down Barkus Rex the whole time. OSS: Some giant monsters dominated the early game and put Goldsee very far behind. One of the biggest creatures in the game, this guy’s built in healing is extremely useful. For this game, the Ape protected an Ether Spider for several turns while dominating the board. NE: The stream dropped out during this game, so some of the action was lost. OSS: A play mistake turned a not close game into a close game. I’ve talked about this card a lot, but this game shows how much better it is when you use it to get back creatures with Play abilities. Here, the Brobnar creatures came into play and impacted the board immediately to make up for waiting a turn. 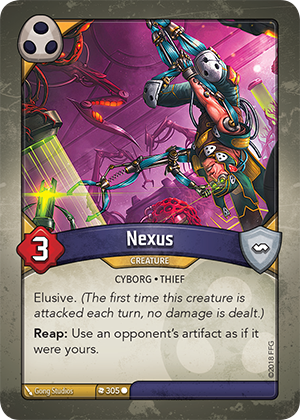 NE: The big swing in this game came when Temujin was setting up a Gateway to Dis by playing a Lifeward, and forgot about the Nexus on the table. This costly play mistake almost lost the game after Temujin was ahead by 2 keys. Note: This game is partially missing due to connectivity issues. OSS: Barkus Rex beat Mr. Goldsee in nearly record time. This card is extremely good, and it is very innocuous at first glance. 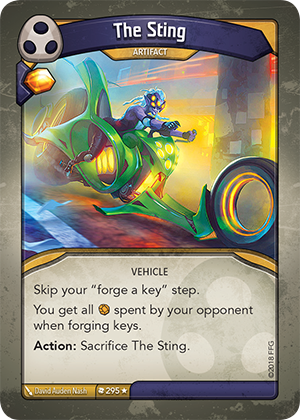 What happens with this card is that the player with it threatens to forge a key, and if the opponent can’t stop the forge, then that opponent can’t really play any cards. 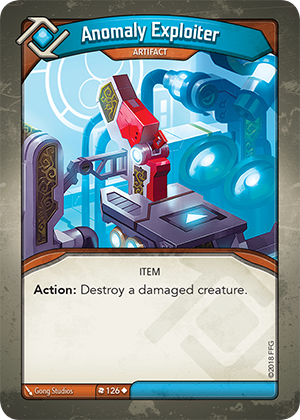 It not that they can’t, its just that any creatures or artifacts that get played are immediately destroyed. Effectively, eventually this card will almost completely skip one of the opponent’s card eventually. NE: The Strange Gizmo set up a Treasure Map, followed by Fertility Chant. This aember burst proved to be too much for Mr. Goldsee. This deck was in control in most of its games and upon reviewing the games, this deck was only in danger of losing one game due to a massive play mistake. The aember control here is just brutal. One of the impressive things about this deck is how well it competes for the board with the limited number of creatures it has. Sound the Horns would combo well with the Arise! a little better if this deck had more Dis creatures and fewer Brobnar, but both cards are just fine here anyway. Arise! really is the linchpin of this deck, and most of the time it will get back Brobnar creatures. The Dis in this deck is disruptive, and has a little bit of everything. Since there isn’t more than one copy of anything in Dis, the deck won’t be consistent, so sometimes it will feel like the answer won’t be in your hand when you need it. However, this deck did go undefeated, so if anything is consistent, it is the ability for this deck to win. This deck does not have a lot of creatures, but does have a lot of aember burst. 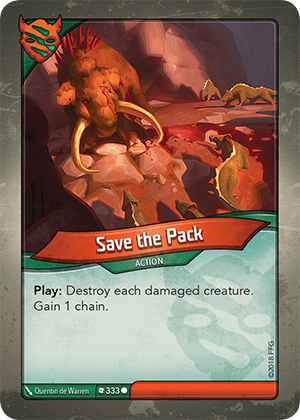 There are some good combos, like The Common Cold and Save the Pack, and Library Access is possibly the best card in the game. 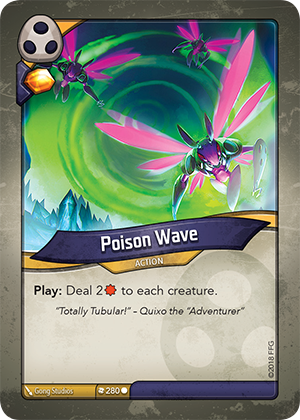 The creatures in this deck do fight for the board outside their weight class, thanks to poison and skirmish. Nature’s Call is an incredible card, and lets this deck get some more mileage out of the Full Moon in the deck. 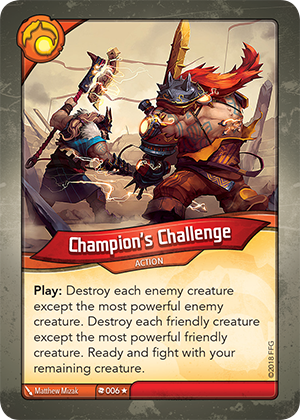 Timed correctly, Fertility Chant can give the opponent aember that this deck could turn around and steal later. 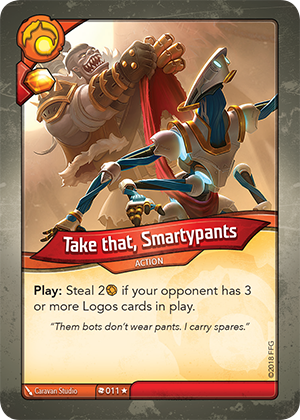 Strange Gizmo is one of the better cards in the game after some play testing, and it would take some pretty convincing arguments to sway my opinion on this. This deck does not have a ton of quality aember control, but it can pick off a stray aember here or there. It doesn’t have enough Shadows creatures for One Last Job to be a blow out. This deck probably benefited from a slightly weaker pod. This deck is weirdly themed, since it has both an Urchin and an Ether Spider. This deck feels like a low-mid tier deck, and aember control was a big problem. It isn’t short on aember control cards, but most of them are creatures, and those are prone to death. This deck had inconsistent board control, and was usually winning while it was in control. Mothergun and Ammonia Clouds help with that, and Chuff Ape is extremely good at protecting valuable creatures like Shadow Self or Old Bruno. Charge! wishes their were more Sanctum creatures, and the Sanctum is mediocre overall. 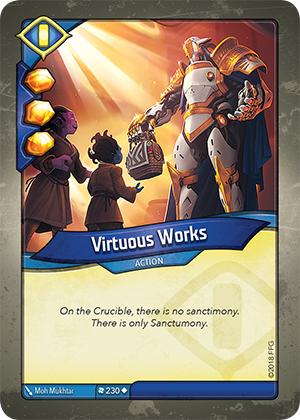 Virtuous Works helps with aember generation, which this deck did struggled with. Deep Probe is a powerful card, and Imperial Traitor is another card that can give you insight into the opponent’s hand. This is a deck that I would file into the category of needing to play it several times to learn the nuances here. The aember control cards in this deck are creature based and, for the most part, require that creature to be ready, and that is ultimately why it lost. There are some powerful aember generation cards in this deck, but there are also some dead weight cards. Briar Grubbling is one of the worst cards in the game, and Phosphorous Stars is rarely worth the chains that you accumulate. The dream would be to play the Dust Pixies and then Total Recall them on the following turn, but that seems like only a pipe dream after playing with this deck. There is a weird mix of big and small creatures in this deck, and the small creatures don’t help with fight for the board. 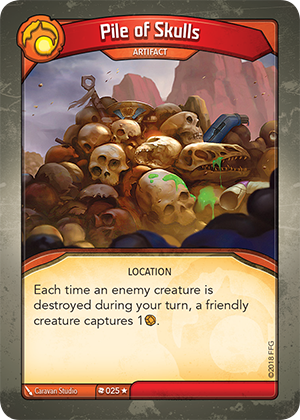 This often means that the opponent has targets for their creatures with Fight abilities. I don’t think this deck will win the Worst of the Worst, and I expect it to make an early exit from that tournament. Known Errors: Justin did forget to flip a key for quite a few turns in the first game. In game 3, Nathan tried to play Untamed and Shadows cards in the same turn, possibly because of an omni action on Special Delivery. This was corrected almost immediately.